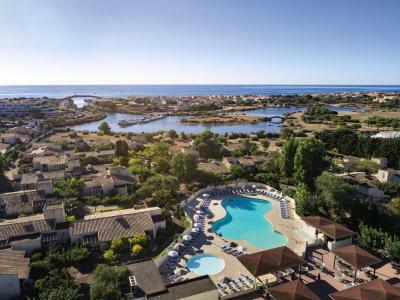 Lock in a great price for Belambra Clubs Cap d'Agde - Les Lauriers Roses – rated 8.3 by recent guests! I had nice time there I will enjoy again on September, really it was very good!!! Magnifique Jardin, piscine, emplacement, arrêt de bus juste en face du club..
Добро качество на цялостното оборудване на помещенията.Добра поддръжка и благоустройство на цялото курортно селище.Красив град. С удоволствие бих повторил посещението си там. bungalow fonctionnel et spacieux, calme et propreté des lieux, nombreux transats à la piscine, animations sympa . One of our top picks in Cap d'Agde.Set in a 6-hectare park, 2,650 feet from the beach and 10 minutes’ drive from the center of Agde, Belambra Clubs Cap d'Agde - Les Lauriers Roses offers an outdoor pool, 2 tennis courts and a volleyball court. Villas at the residence have a modern décor and offer a private terrace with patio furniture. You can prepare meals in the kitchenette, which includes electric hotplates, a fridge-freezer and dishwasher. Additional facilities in each villa include a flat-screen TV and safety deposit box. All villas have a modern bathroom, equipped with a shower. The residence’s restaurant serves breakfast and a buffet-style dinner, and drinks are served in the bar. Paid WiFi is provided and on-site activities include table tennis and mini golf. With free private parking on site, the residence is located 16 mi from Béziers. Cap d’Agde is located 1.7 mi away and Agde Train Station is a 10-minute drive from the residence. When would you like to stay at Belambra Clubs Cap d'Agde - Les Lauriers Roses? With a furnished terrace, this villa offers a kitchenette with electric hotplates, a fridge-freezer and dishwasher. This apartment has a flat-screen TV, microwave and patio. House Rules Belambra Clubs Cap d'Agde - Les Lauriers Roses takes special requests – add in the next step! Belambra Clubs Cap d&#39;Agde - Les Lauriers Roses accepts these cards and reserves the right to temporarily hold an amount prior to arrival. Belambra Clubs Cap d'Agde - Les Lauriers Roses accepts these cards and reserves the right to temporarily hold an amount prior to arrival. Please note that for stays of less than 3 nights, bed linen, towels and end-of-stay cleaning are included in the price. A baby kit including a cot, baby bath and high chair can be provided. If you require this facility, please leave a message in the comments box, during the reservation process. The outdoor swimming pool is open from April until the end of September. Quiet location. Short walk to naturist village. The bed. Not very comfortable because of the mattress. It was a to hard.